Fit partitions with thickness of 1 1/2" - 2 1/2"
Optimize work spaces and increase opportunities for collaboration with Quartet Cubicle Partition Hangers. The partition hangers attach bulletin and marker boards over cubicle partitions with ease. These particular hangers are designed for Cubicle walls that measure between 1-1/2" and 2-1/2" thick. Welcome to MyBinding video. These are Quartet’s Nickel Plated Cubicle Partition Hangers. Now you can optimize work spaces and increase opportunities for collaboration with these cubicle partition hangers. The silver nickel plated finish compliments any contemporary environment. They’re slightly adjustable and fits partitions with thicknesses of 1 ½” to 2 ½”. 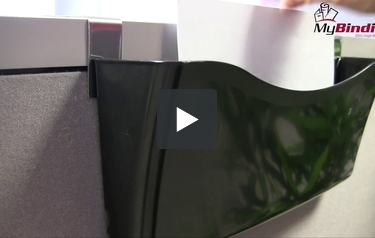 They’re easy to use and place them right on the cubicle walls and perfect for holding marker boards, bulletin boards, file holders and much more. That’s Quartet’s Nickel Plated Partition Holder. For more demos, reviews and how-to’s, check out MyBinding.com.